SHANGHAI – The China International Exchange Committee for Tall Buildings (CITAB) and the Council on Tall Buildings and Urban Habitat (CTBUH) are pleased to announce the award recipients for the inaugural CITAB-CTBUH 2016 China Tall Building Awards. With the support of the Architectural Society of China and the Architectural Society of China Shanghai, the first year of this regionally focused awards program was very successful, with numerous high-quality projects entering into the running under six categories of recognition. 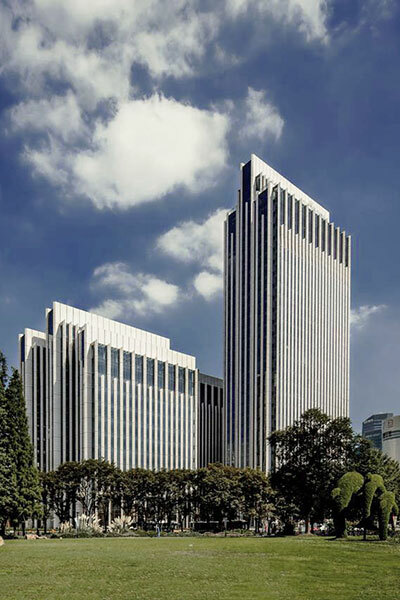 Based on the successful CTBUH worldwide tall building awards program, the CITAB-CTBUH China Tall Building Awards Program recognizes the teams responsible for the most successfully executed high-rise projects in China. 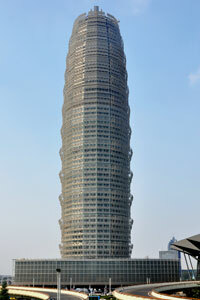 With an eye for innovative design, sustainability considerations, life safety, and contributions to the urban habitat, the China Awards Jury – a group of experts in the tall building industry jointly appointed by CTBUH and CITAB – selected projects that exhibit processes and innovations that add to the profession of design and enhance the cities and lives of their inhabitants. 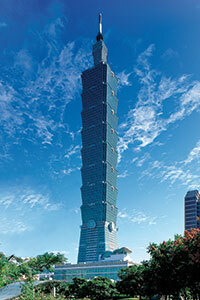 This category recognizes projects that have made extraordinary contributions to the advancement of tall buildings and the urban environment, and that achieve sustainability at the highest and broadest level. 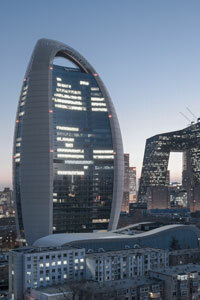 Award recipients in this category are recognized as follows: Excellence Award recipients represent the highest level of submitted projects, all of which will be considered to receive the Overall 2016 Best Tall Building China Award at the inaugural China Awards Symposium, Dinner and Ceremony event in Shanghai, May 2016; while Honorable Distinction recipients represent standout projects from those submitted, deserving of special recognition. 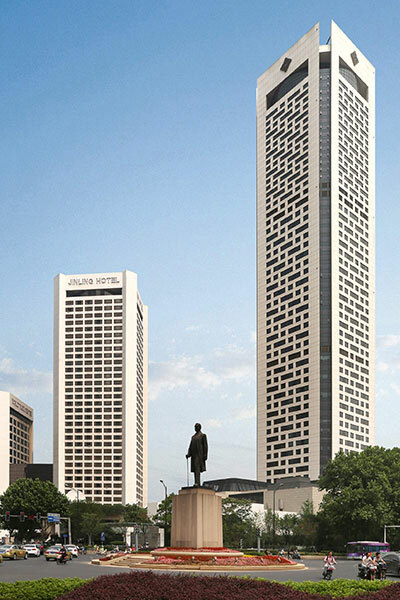 Asia Pacific Tower & Jinling Hotel, Nanjing, is a vertical extension of an existing landmark hotel development, one that provides an additional 370 five-star rooms and suites in the form of a 57-story tower that rises to a height of 240 meters. The tower, and the concomitant redevelopment of the hotel complex, brings a sense of formal order to the site, pushing building volumes out toward the edges and drawing visitors inwards. 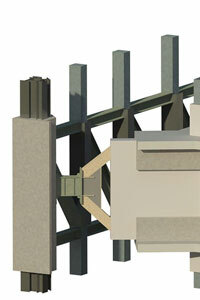 The jury felt that the role of the tower as a harmonizing element for its urban surroundings was particularly well-fulfilled. 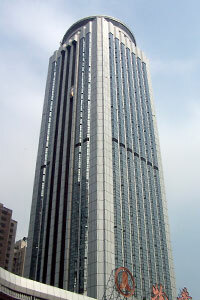 See the building profile on The Skyscraper Center. 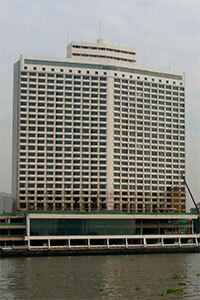 Bund SOHO, Shanghai, is a multi-tower development that maximizes its limited exposure to Shanghai’s famous riverfront boulevard – the Bund – by employing an interplay of void and solid that entices exploration, such that many views out of, into, and through the complex feel “privileged.” The jury appreciated how the orientation of the site, as well as the formal approach of the towers, make access convenient and encourages exploration, creating a dynamic urban environment focused on people and socioeconomic activity. 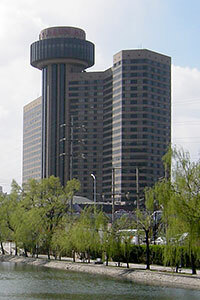 See the building profile on The Skyscraper Center. Hainan Road Lot 10, Shanghai, defies the hard and cold image of conventional tall buildings, utilizing a curved shading system that gradually changes shape as it gains altitude, forming a rhythmic façade with a topographical surface. 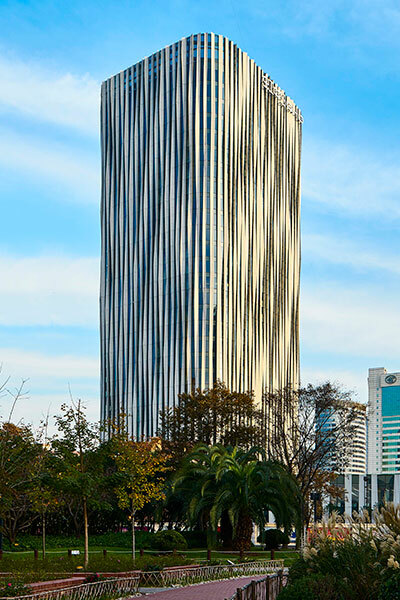 In addition to having a sinuous form, the tower boasts an assortment of green features, like a landscaped roof and podium, low-e insulating glass panels, and an extensive grey water collection system. 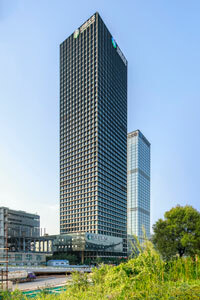 See the building profile on The Skyscraper Center. 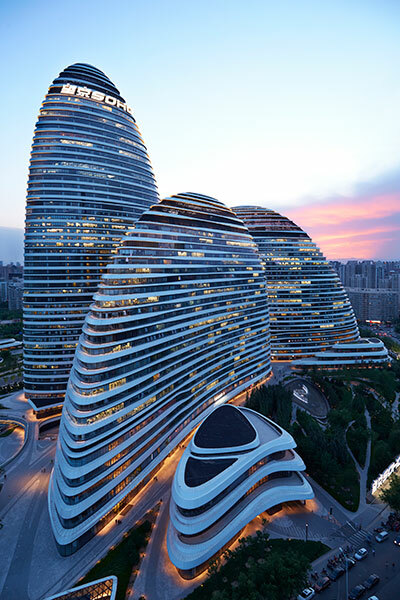 Wangjing SOHO, Beijing, is a complex that resembles three dynamic mountain- or fish-like forms, pulling flow through the site with their convexity. 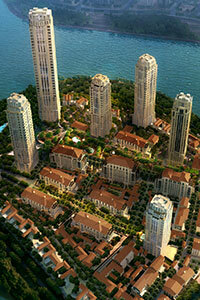 The juxtaposition of the towers affords a continuously changing, elegant, and fluid view from all directions. The project is particularly successful and properly activated as a result of its emphasis on transportation access, with special parking spots reserved for low-emission cars, bicycle parking, direct subway connections, and bus station adjacency. 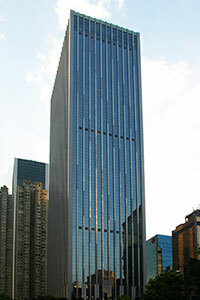 See the building profile on The Skyscraper Center. 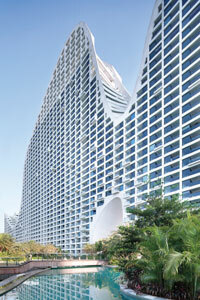 Fake Hills Linear Tower, Beihai, despite its tongue-in-cheek name, presents a genuine hybrid experience between high-rise life and a seaside park. 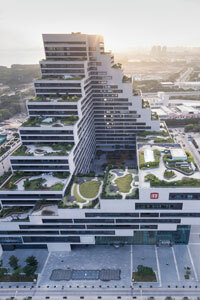 Hua Nan Bank Headquarters, Taipei, is equipped with numerous sky gardens that make for casual meeting and relaxing spaces for office staff and serve as buffer zones for reducing heat gain. 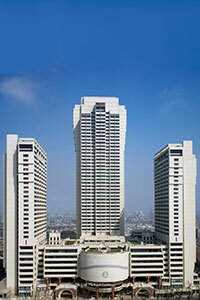 Jiangxi Nanchang Greenland Central Plaza, Parcel A, Nanchang, comprises twin towers that lie 100 meters apart at the center and anchor an emerging business, civic, and residential zone in the booming new city. 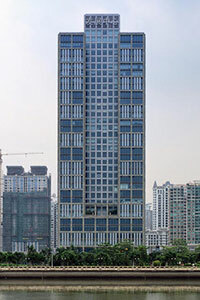 Jiangxi Nanchang Greenland Zifeng Tower, Nanchang, brings a striking presence to the city skyline and prioritizes sustainability by maximizing the use value of its key design elements. 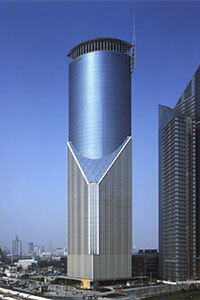 Lujiazui Century Financial Plaza, Shanghai, succeeds in achieving a scale and design that connects human beings to the architecture, and the architecture to the city. 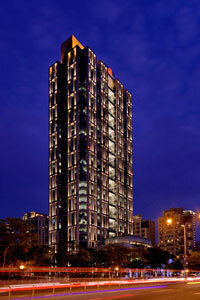 OLIV, Hong Kong, employs a clean, elegant array of aluminum cladding calibrated to fit perfectly onto the concrete structure. 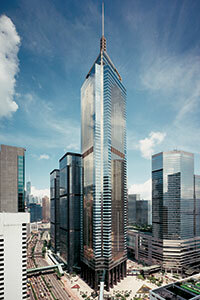 The result is an organically shaped tower that contrasts with its neighbors. 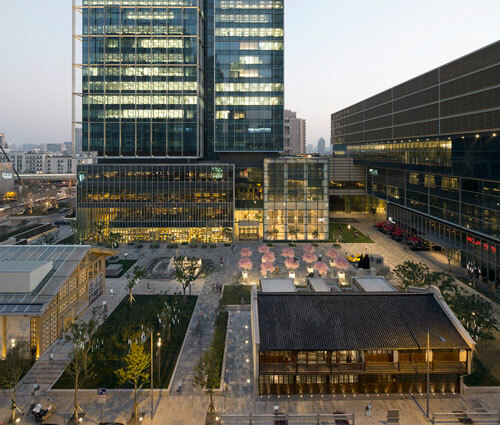 People’s Daily New Headquarters, Beijing, achieved eminence as a result of a desire to embody creativity and contemporary design, yet also reflect local culture and tradition. 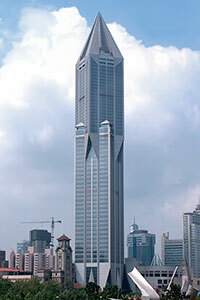 Taiping Finance Tower, Shenzhen, reflects the understated elegance and environmental responsibility of its client, a large insurance company, which places a high priority on security and confidence. 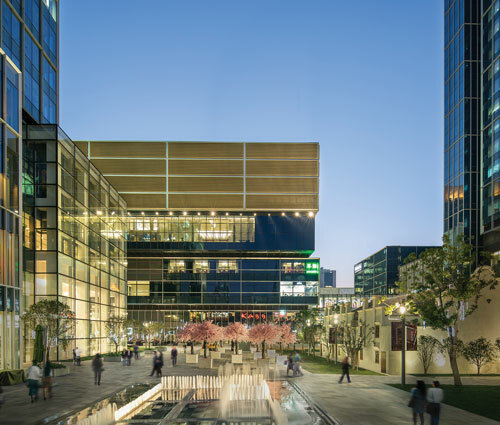 Zhengzhou Greenland Plaza, Zhengzhou, is instantly recognizable for its painted aluminum screens that create dynamic movement and give the building a fine-grained texture. The CITAB-CTBUH 2016 China Urban Habitat Award recognizes projects ranging from brilliantly executed master plans to urban designs that have created quality urban environments, where the interface between tall buildings and the urban realm is exemplary. These projects demonstrate a positive contribution to their surroundings, adding to the social sustainability of both their immediate and wider settings, and representing design informed by environmental and cultural contexts. 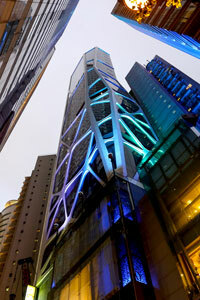 Jing An Kerry Center, Shanghai, is the result of ten years of strategic planning and design. 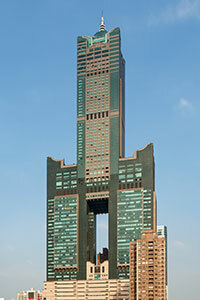 The complex extends not just 58 stories above ground, but delves into the history of China, while using Shanghai’s transportation facilities on-site to create a development that is pedestrian-friendly, accessible, and economically sustainable. The prosperity of the development into the future is assured through the incorporation of versatile spaces that can be repurposed as local needs and conditions change over time. Heart of Lake, Xiamen, demonstrates how to establish a high-density pedestrian node by combining point towers with thoughtful, low-scale urbanism through the addition of mid-rise structures. 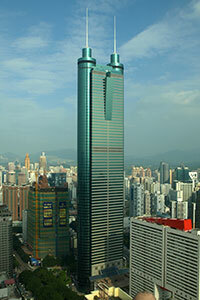 Shenye TaiRan Building, Shenzhen, is designed to be inviting on a local, human scale, yet prominent at an urban scale. This is achieved through a series of stepped rooftop terraces and a large central communal space framed by the mass of the building. 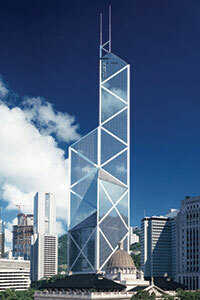 The CITAB-CTBUH 2016 China Innovation Award recognizes a specific area of recent innovation in a tall building project that has been incorporated into the design, or implemented during construction, operation, or refurbishment. 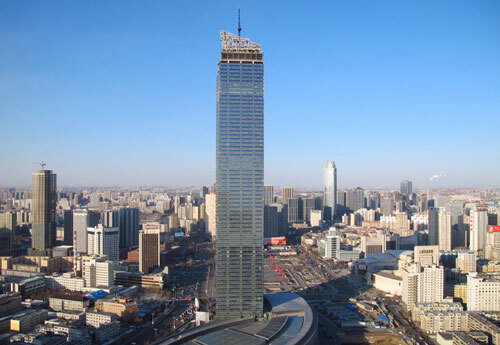 Unlike the China Best Tall Building award, which considers each project holistically, this award is focused on one special area of innovation within the design, construction, or operation of the project. 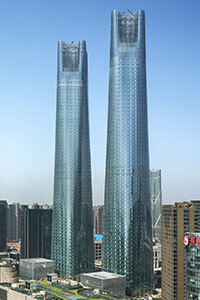 The Mega-Suspended Curtain Wall of Shanghai Tower, Shanghai, is unique for incorporating two independent envelopes so that they act in harmony with one another. The inner skin is circular, while the outer skin is shaped like a rounded triangle in plan, which tapers and twists along the vertical axis. 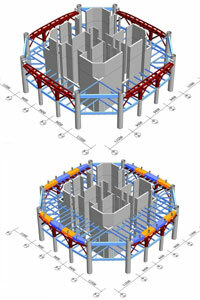 This design strategy enables the megatall building to achieve optimal wind performance, while allowing the primary structure to remain conventional and efficient. The spatial separation between the two skins creates an atrium space every 12 to 15 floors, a design feature that the jury acknowledged as particularly novel. 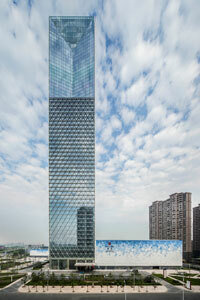 The façades of the twin towers anchoring the Jiangxi Nanchang Greenland Central Plaza, Parcel A, Nanchang, represent the first comprehensive application of Cold Bent Glass at the Supertall Scale, an impressive feat that lends the towers a consistent luminous appearance. 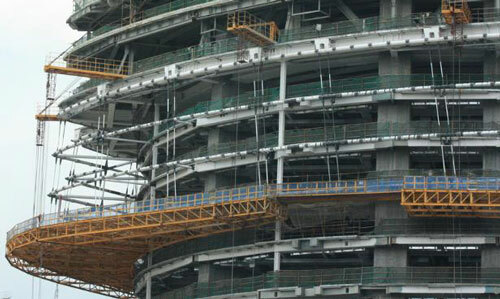 The Construction-Phase Internal Force Redistribution, as applied to the Wuhan Center, Wuhan, is remarkable for reducing the loads distributed on the transfer beams rather than increasing their size, giving greater flexibility to designers, and more control over loads to engineers. 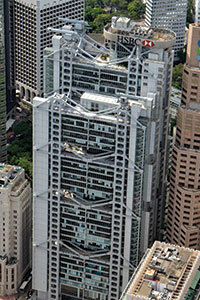 The Hybrid Outrigger System used in the North Tower of Raffles City Chongqing is innovative for its integration of various structural solutions that yield exceptional performance under considerable seismic loads. 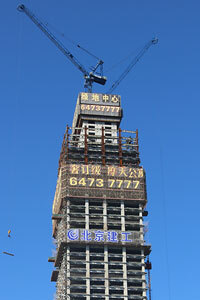 The CITAB-CTBUH 2016 China Construction Award recognizes construction excellence in a tall building project, including but not limited to quality in construction, technical innovation, proficiency of execution of a complicated or exacting design, triumph or difficult conditions, superlative speed, efficiency, or scale. Award recipients demonstrate a commendable combination of some or all of the above. 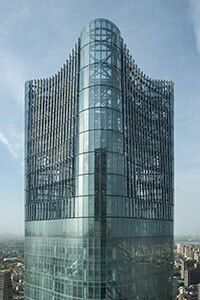 Forum 66, Shenyang, stands as a new focal point for the city and a leading example of Chinese excellence in construction. 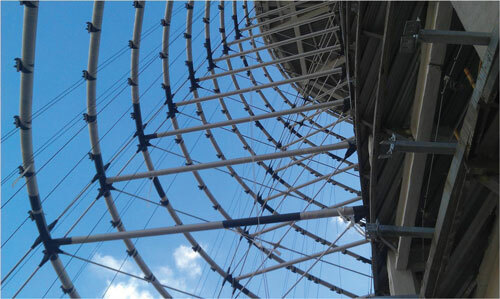 The construction process incorporated unmatched safety considerations and oversight mechanisms, and overcame challenges arising from its unique structural system. 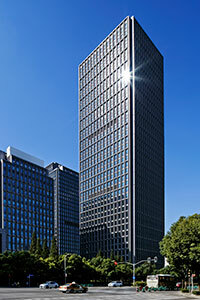 The tower was conceived to be part of a family of neighboring towers united through the use of a consistent curtain-wall design and an angled rooftop that leans away from the center of the complex. 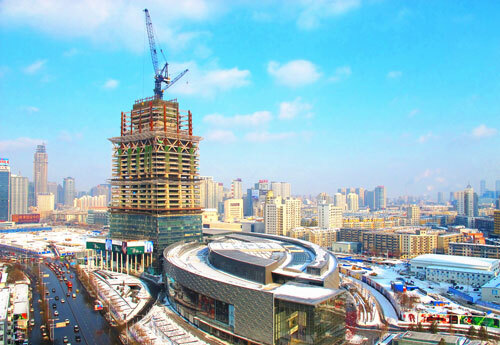 Beijing Greenland Center, Beijing, has earned recognition for the use of various innovative technologies in its construction, including: high-altitude spraying systems, remote quality inspection tools, and BIM technology. 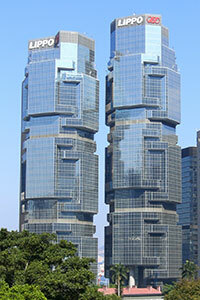 The CITAB-CTBUH 2016 China Outstanding Achievement Award is bestowed to an individual who has made extraordinary contributions to the advancement of tall buildings and the urban environment in China during their professional career. The individual’s contributions may be well known or little known by the public, and may take any form, such as completed buildings, research, technology, methods, ideas, or industry leadership. 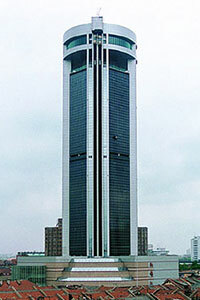 Dasui Wang, ECADI, having committed his life’s work to a series of significant high-rise buildings in practice and core technology innovation, such as the Shanghai World Financial Center, Shanghai Tower, the Goldin Finance 117 in Tianjin, and Suzhou Zhongnan Center. Wang Dasui is an outstanding engineer and designer, who has overcome the list of significant technological difficulties presented by domestic high-rise buildings, and has led the development of multi-disciplinary research. 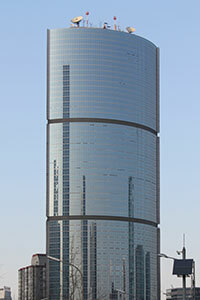 He is also a skilled practitioner of creating beauty in buildings with architectural structure. 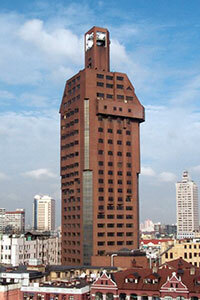 His outstanding contribution to and influence on the high-rise building industry and urban habitat development of China are widely recognized by industry peers. 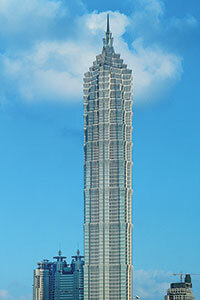 In addition, Mr. Wang has also led key projects that include the Oriental Pearl Television Tower, Pudong International Airport terminal, CCTV Headquarters, Tianjin Tower and the Expo Axis of Shanghai Expo 2010. 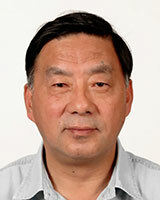 His many projects have been awarded major prizes by MOHURD and the Architectural Society of China, and he has also been involved in the compilation and peer review of state-level architectural design codes. 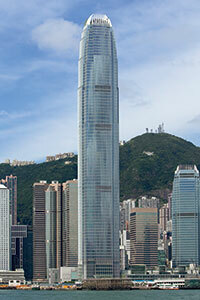 The CITAB-CTBUH 2016 Legacy Award recognizes proven value and performance over the period of time from China’s economic opening in 1978 to a point up to 10 years preceding the award year. This award gives an opportunity to reflect back on buildings that have been completed and operational for at least 10 years, and acknowledges projects that have performed successfully long after the ribbon-cutting ceremonies have passed. In its inaugural year, ten winners and ten Honorable Distinction recipients were selected, representing a wide range of completion years between 1978 and 2005.